I became interested in model railroading and model scratchbuilding in 1988. 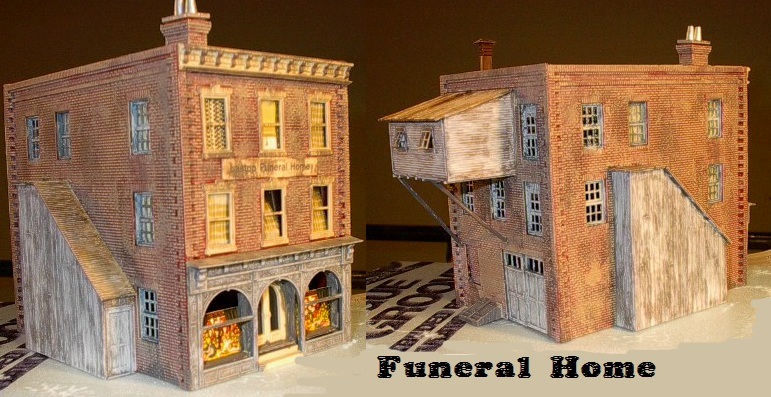 The most interesting aspect of the hobby was creating scale buildings from photographs. I happened by chance to meet a scale modeler named Tom Lowry at a model railroad convention in Binghamton, NY. It happened to be he lived in Brownstown, Lancaster County--only 15 miles from my Columbia apartment. He invited me to join the Stiegel Valley Model RR Club in Manheim. Since he and his wife were planning to drive into Canada from Binghamton, and he didn't want to take the scale model he entered in the model show with him, he asked me if I would take it home with me, and keep it until he returned a week later. His model remained in its carrier all week. When he returned, he called me and invited me over to his place in Brownstown. The scale model buildings he had built lined all the shelves in his work room. He asked me if I opened his model. When I told him I hadn't, he opened it for me---and showed me his BEST OF SHOW model from the Binghamton Tri-Regional Convention of 1991.Tom gave me a lot of pointers on scale model building with styrene, and was a great mentor. We worked on buildings at Stiegel Valley together. 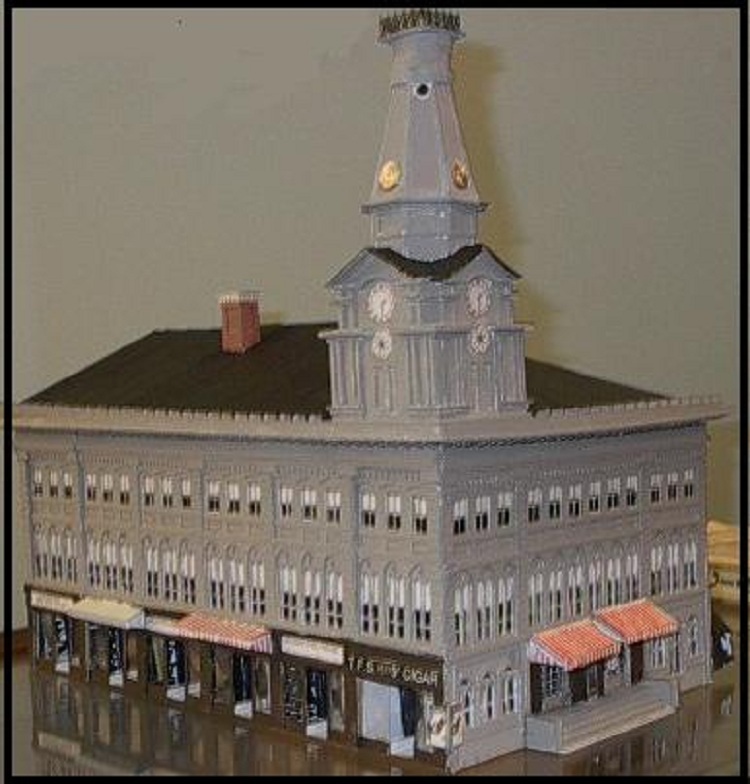 When my reputation of scale model building reached the Columbia Historic Preservation Society (in Columbia), in 2000, I was asked if I would build a 200 sq.ft. HO diorama for their model train display. The diorama was to be of the neighborhoods of Columbia along the railroad. The diorama would depict the earlier half of the 20th century. I'm still working on that display today. My scale models are built in either HO or N Scale. In HO, a one-foot ruler in standard size is transformed into a 1/8th inch ruler. HO is "one-eighth inch to the foot scale". 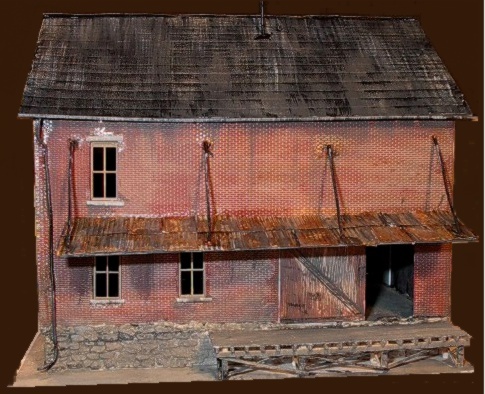 A 32-foot high building stands 4 inches high on an HO layout. Items in our real world are shrunk to 1/96 (1/8 x 1/12) of their original size in HO. Model railroad cars and engines are made to 1:87 scale (just slightly larger than my 1:96 version). As for N-Scale, let's think even smaller. Where it takes 96 HO items to fill the same volume as he real thing, it takes 160 N items to fill the same volume. 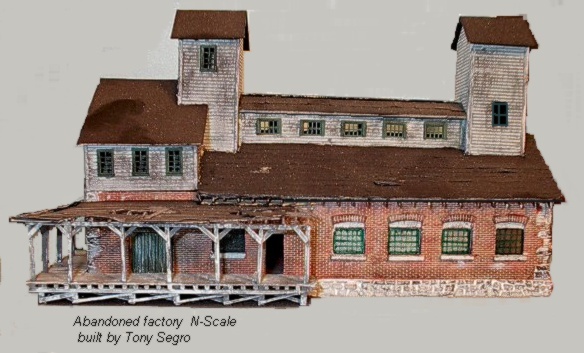 N-Scale items are 59% the size of HO items. For modeling, I use various media from styrene (a smooth plastic material) to wood, clay, plaster and various thicknesses of cardstock. I've used illustration board (the backing for picture frames) to thin cards such as 3x5 cards. I've used round, square and flat toothpicks. For some items, I've used brass or copper rods and sheets. Take a look at just a few of my scale models by clicking on the links at the right. For other models, click on the CHiPS HO Model Railroad link. Once I learned AutoCAD, I was able to create building drawings in any scale, and to construct 3D models from those drawings. Copyright (c) 2012 tonysegro.com. All rights reserved. Design by CSS Templates.